Photographic exhibition uses wild fashion experimentation as an excuse to plunge deep into a Nordic dream world. Eerie, edgy and entirely unexpected, “The Weather Diaries” is a photographic exhibition that uses wild fashion experimentation as an excuse to plunge deep into a Nordic dream world. Commissioned by Nordic House Reykjavik as part of The Nordic Fashion Biennale, 2014, it features sumptuous, large-scale photographs by collaborators Sarah Cooper and Nina Gorfer who split their time between Sweden and Germany. Their images are dark and rich in patina, calling to mind the Dutch Golden Age or Pre-Raphaelite fantasies more than any photographic precedent. While they document work by 11 design teams from Iceland, Greenland and the Faroe Islands, it’s Cooper & Gorfer’s own aesthetic that dominates the show. Installations by some of the fashion designers, however, make key contributions to the exhibit. From the Faroe Islands, Guđrun & Guđrun bring “Pesjur” (a Faroese word for irregularly cut lambskins that look like small haystacks). Hanging in the middle of one gallery, “Pesjur” is an installation of 10 woolly clusters, with a fragile, loose-knit chemise rising from one of them. The garments inspire photographs steeped in mystery. “Sára, Armgarđ and Alda on a Hill” is a study of isolation in a forbidding landscape. 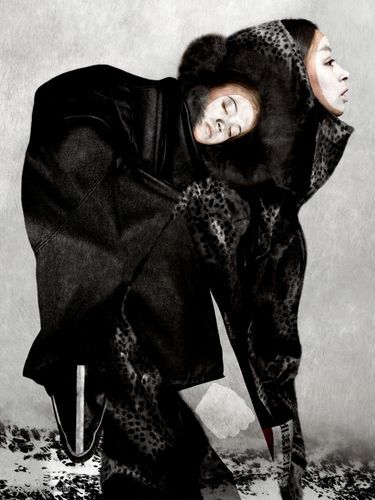 In “Girls as Twins,” two young female models look conjoined inside a single dress. 10 a.m.-4 p.m. Tuesdays-Saturdays, noon-4 p.m. Sundays, through Nov. 6. Nordic Heritage Museum, 3014 N.W. 67th St., Seattle; $6-$8 (206-789-5707 or nordicmuseum.org). The work of Barbara I Gongini, also from the Faroes, strikes a Rembrandt note in Cooper & Gorfer’s hands, as the radiant face of an old woman is wreathed in tangles of black crochet in “Kirsten Against Black.” In “Juanita with Black Hands,” another Gongini creation engages in similar shadow play. The phrase “Greenlandic fashion design” would seem to be a non-starter, but Cooper & Gorfer found striking work there, too. Under their lens, Bibi Chemnitz’s sweaters and jackets become compound garments that accommodate more than one person. It’s an illusion, perhaps, but the surreal results are irresistible. 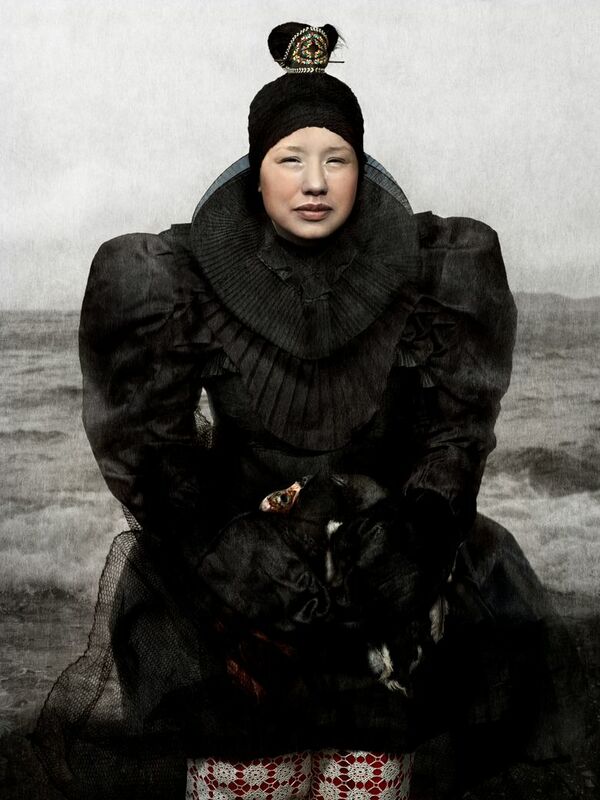 The bead dresses of Nikolaj Kristensen and neo-Elizabethan wear of Najannguaq D. Lennert (check out that ruff collar!) also make powerful photographic subjects. Iceland, naturally, has a strong presence in the show. “No. 13,” a menacing installation by JÖR by Guđmundur Jörundsson, gathers nine faceless male mannequins — five suspended from the ceiling, four lined up like corpses on the floor — all dressed in zanily varied pinstripe suits. 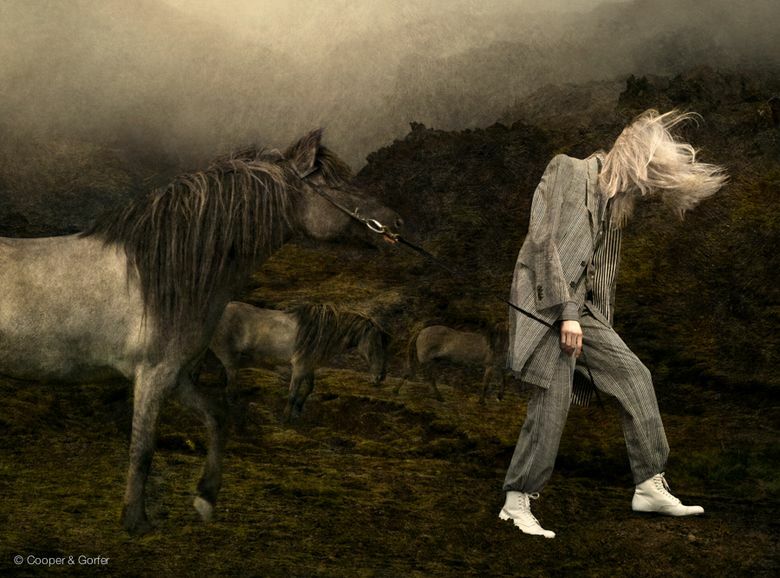 In Cooper & Gorfer’s “The Herder,” a blonde JÖR model in playful pinstripes (her head down, her face obscured) leads a pony across a desolate moor. The image is so painterly it’s hard to believe it’s a product of film or pixels. Mundi (mononyms are popular) likewise contributes an installation — a towering, jellyfish-inspired dress — that’s featured in Cooper & Gorfer’s haunting underwater or windblown photographs. 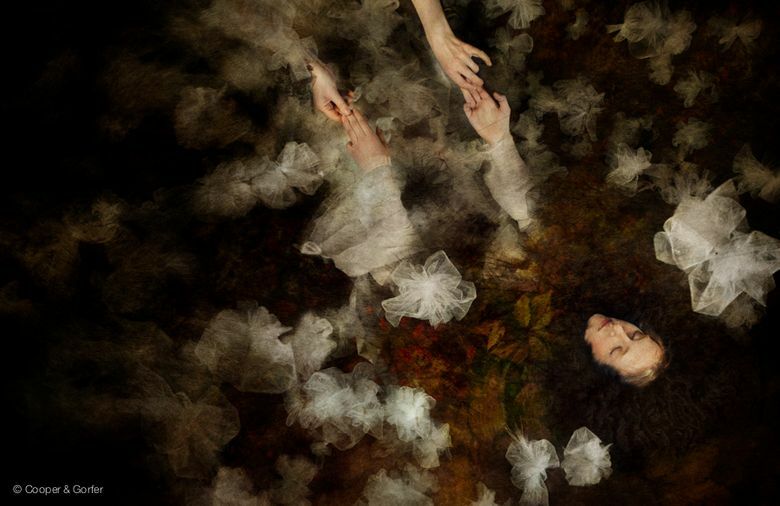 In an informative 20-minute documentary accompanying the show, one of Mundi’s models floats Ophelia-like in a steaming Icelandic river, the tentacles of the dress trailing downstream from her. Photographs of the tulle-crazed work of STEiNUNN are stunners — especially “Steinunn, Birna, Hands,” in which the model half floats, half drowns in clouds of fabric, her arms outstretched to make fingertip contact with a pair of hands descending from above. Note: STEiNUNN’s director, Steinunn Sigurđardóttir, will create a large installation in the week leading up to an Oct. 13 “reopening” of the show. The whole exhibit is atmospherically lit, its cavern-like sequence of galleries pulling you into twilit mythical realms. This is the North American debut of “The Weather Diaries,” and it’s a true coup for the Nordic Heritage Museum.